Notes: 1998, 2002, 2012. Photos © 2011 Tom Musolf, Loma Prieta Paddlers. This is one of the most scenic class IV runs in California, and is easily approachable from Nevada City. 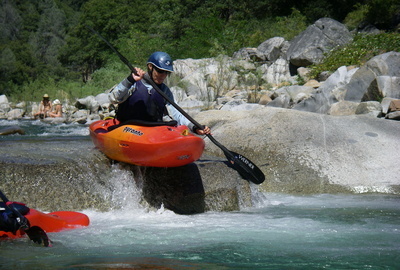 In most years there are sufficient kayaking flows for several months, although the flow window for rafting can be short. The only drawback of this run is its relatively short river distance, but plentiful playspots permit an all-day run if you wish. Old guidebooks mention a broken-down dam with dangerous overhead wires, but this hazard has either been removed or has washed away, so no portages are necessary on this run. A group of us ran Edwards to Purdons on the South Fork Yuba at 184 cfs. This is a lower level than is commonly run, but still a whole lot of fun. A few more cfs would have been great, but hey, it was almost the end of July, the sun was warm, the water clear and the river was as scenic as ever. I'm glad we didn't let the low water keep us off of the river. There were only a couple of drops that we had to bump our way down; other than that everything channelized really well and there was always a good route through. 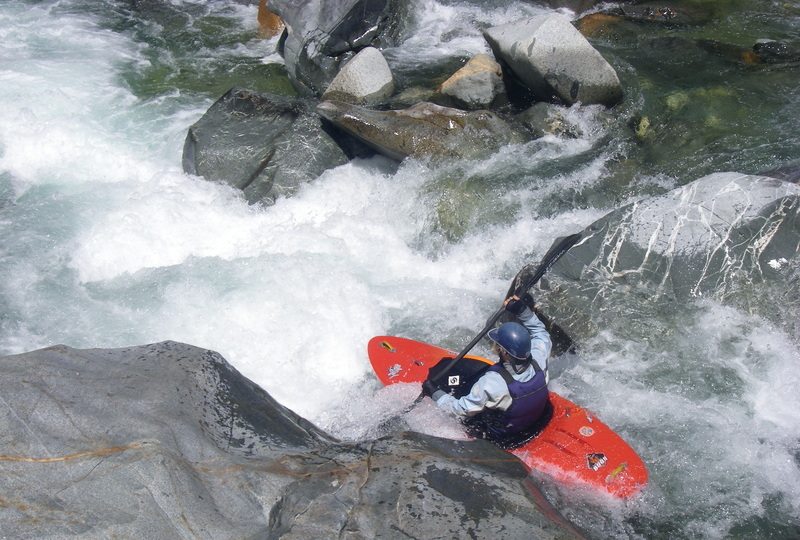 There wasn't always a lot of room to maneuver, but we could often paddle right up the the lip of a drop before deciding which line to take. We boat scouted all but one drop. A hiking trail follows the left bank for the entire distance, making beaches on that side popular with local sunbathers, and providing a possible foot-shuttle alternative. 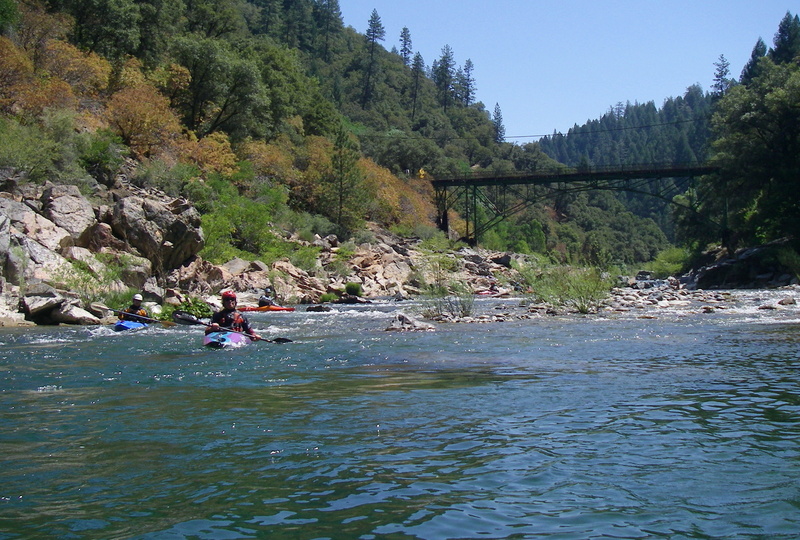 The South Yuba even has its own website. Excellent camping is available on the north bank uphill from put-in, if you want to combine this run with another in the area. Put in anywhere along the highway bridge. 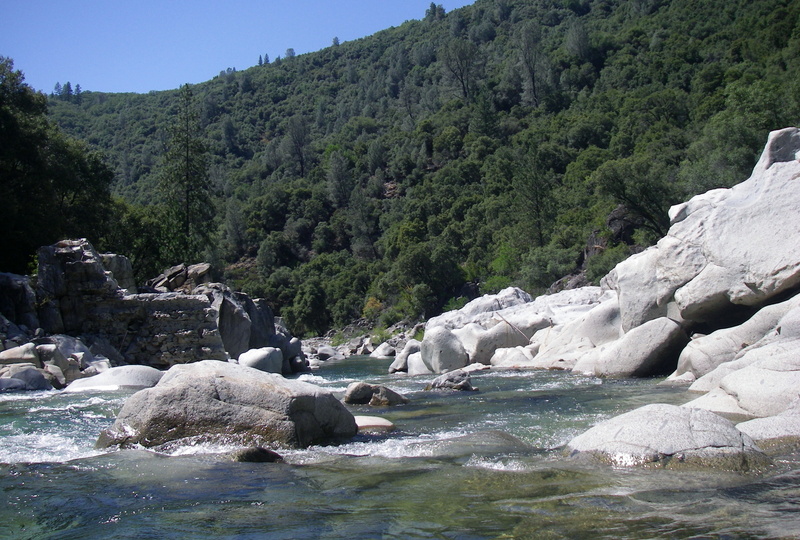 The right bank is rocky but there is a nice shady beach just upstream on river left. 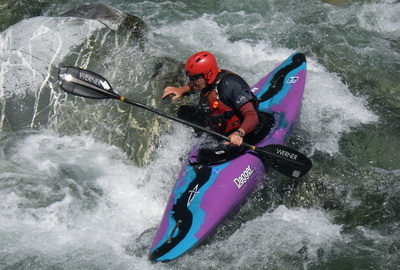 A long whitewater chute leads into a large curling hydraulic that can flip any kayak if approached from the wrong angle. 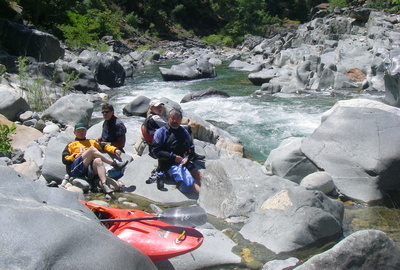 Bedrock fence with rock outcropping on the left and cliff on the right offers a choice of several good kayak routes. 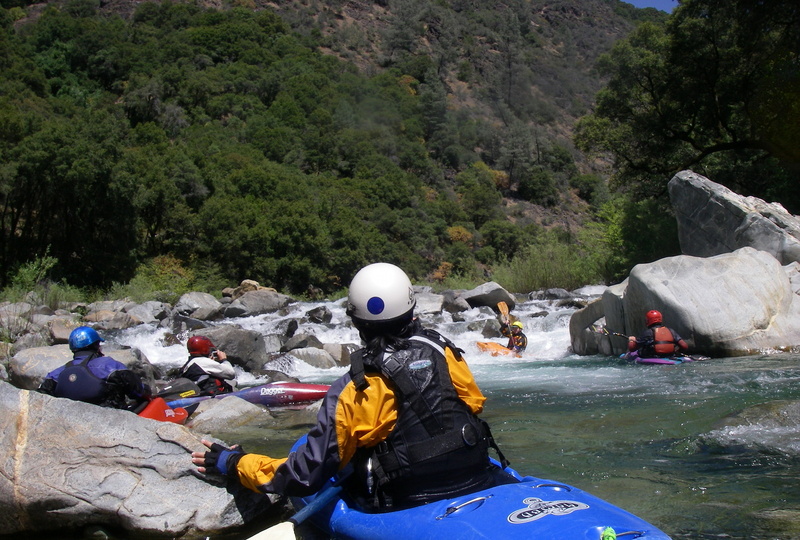 This is one rapid that might be too narrow for rafts at low water. Several class III rapids follow. The right side offers a class III+ route, but the middle sections look quite dangerous, with undercuts and body sieves everywhere. One spot in the middle looks like a flushing toilet at certain flows. Two offset holes on center left, then a rock shelf and run-out. The best line seems to be on the left at all flows. A long rapid with many rocky hydraulics. Old broken down dam, no more wires hanging down in the river. The drop above, which angles to the left, could cause a swim. The angling drop is followed by a series of turbulent drops stretching past the old dam. Few Choices, class IV, constricted by many large boulders. Last Big One, class III, a steep drop among large boulders. From here, class II-III read and run to take-out. Purdons Crossing bridge. The left bank makes the best take-out. Missing this take-out could result in a portage fest. Downstream of Purdon's Crossing, the gradient increases to 125 fpm then to 155 fpm in the final mile above the highway 49 bridge. With many undercut boulders and body strainers, it is a gnarly class V+ run with not all that much fun stuff. 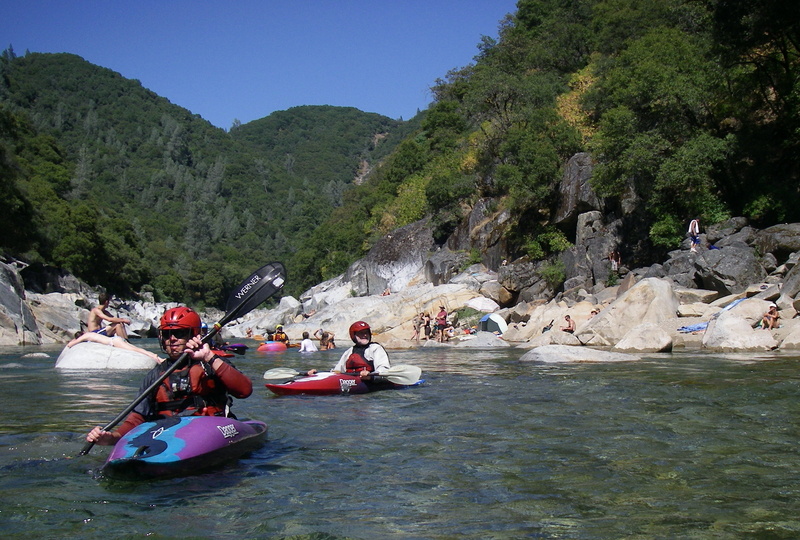 Downstream of highway 49 to Bridgeport is a great class V section, considered one of the best expert kayak runs in California, described here. To reach put-in from Nevada City, turn west from highway 20 onto highway 49 north. In only .3 mile, turn right onto North Bloomfield road. in another .6 mile, turn right at a T intersection and drive downhill on a paved road to Edwards Crossing. Parking is available uphill south of the bridge. To reach take-out from there, return south to the T intersection, with North Bloomfield road, but continue straight instead of going south towards highway 49. After a right turn, this becomes Lake Vera-Purdons road, and soon changes to dirt for the descent down to river level.